Imagine getting sick in, say, rural China. You’ve studied a bit of Chinese and decided to travel there. Then your stomach starts to hurt. A lot. No one at the hospital — from doctors to receptionists — speaks English, so when you try to communicate your symptoms in English, no one understands. They talk to you in Chinese and you understand the basics: lie down here; where does it hurt? But you need to tell them your medical history; they need to tell you their diagnosis and proposed treatment. Now imagine you’ve come to the hospital in extreme pain, or severely injured in a car accident, or in labor. This is the experience Deaf people encounter every day in their own country in hospitals and doctors’ offices: they need to explain their symptoms and history and to understand their diagnosis and treatment options in their native language — American Sign Language (ASL) — while medical personnel attempt to communicate with them using written notes or lip reading. Since ASL is a completely different language from English — and the latter generally a second language for most Deaf people — this puts the Deaf patient in the same situation as the traveler above. And written notes? Even if you’re fluent in English, imagine conducting your next doctor’s appointment — or emergency room visit or childbirth — by writing notes back and forth with doctors, nurses, and technicians; now imagine (if you’re native English speaker) writing back and forth in French or Russian. Imagine being a doctor and trying to obtain informed consent under these circumstances. 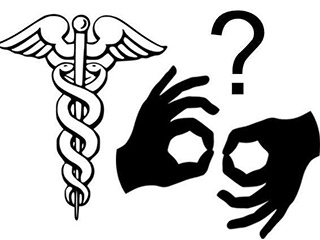 Medical personnel should be insisting on — not resisting — qualified sign language interpreters. The Americans with Disabilities Act requires doctors and hospitals to provide Deaf people with “effective communication.” In many cases, this means a sign language interpreter. Because this need often arises urgently — when no one can wait for the results of a lawsuit — and because many doctors are unaware of their obligations, CREEC has developed a Quick Guide to Sign Language Interpreters in Medical Settings. This Quick Guide, developed in 2017 — after years of providing the same information in emails, phone calls, and presentations — provides medical personnel and Deaf patients with the essential ADA requirements as well as resources for finding interpreters both in Colorado and around the country. CREEC also works with Deaf people directly who need medical interpreters by helping them reach out to doctors and hospitals, explaining the law, and connecting them with resources. Through this project, we have assisted over 25 clients to get the communications they need without having to resort to litigation. In addition, CREEC has represented a number of individuals in court when medical facilities have refused to provide effective communication. CREEC will continue to educate medical personnel about their obligations under the ADA and to provide support for Deaf people seeking to communicate effectively with their doctors. If you are interested in learning more about this issue, check out the resources in the Quick Guide and feel free to send it along to friends and colleagues in the medical world. Deaf people who have questions or would like assistance working with medical or other providers to get effective communication can contact us at intakes@creeclaw.org. Since its formation in September 2018, CREEC’s Immigration Detention Accountability Project (IDAP) has fought to assert the rights of and improve conditions for hundreds of immigrants in ICE custody in Colorado and across the nation and is laying the groundwork for future litigation efforts. Under Director Liz Jordan’s leadership, IDAP has focused on three key areas thus far: legal challenge of conditions of confinement in immigration detention centers, legal challenge of discrimination against detained immigrants with disabilities, and education and outreach on detention conditions and treatment of immigrants with disabilities. Recent projects include procurement of previously unreleased documents relating to life-threatening treatment of detainees in Colorado and California; cessation of improper use of federal prisons for immigrant detention in California; multiple advocacy efforts; and educational initiatives to raise public awareness of the conditions facing immigrant detainees and their civil rights. In an ongoing transparency litigation case in Colorado, IDAP procured previously unreleased ICE documents relating to deaths of immigrants in detention and treatment of people with disabilities. These documents had never before been made public and are part of a larger effort to hold ICE accountable to the public through the release of information. Last summer, IDAP also filed a federal class action lawsuit in Victorville, California on behalf of asylum seekers who were being illegally held in a federal prison despite not having criminal convictions. As a result of CREEC’s lawsuit, the U.S. government’s practice of holding detainees who have not committed a crime was discontinued at this prison. Additionally, IDAP offers civil rights consultation to lawyers for immigrants with disabilities, represents people in ICE custody, advocates for adequate care and accommodations for people in ICE custody, and investigates ongoing conditions of confinement issues. As IDAP’s Director, Liz makes regular appearances in the press on abuses within immigration detention centers, most recently on the lack of sufficient medical care and the outbreak of mumps at the detention center in Aurora, Colorado. Liz has also presented at the University of Denver Sturm College of Law, the ACLU national staff conference, and the Colorado Bar Association on the rights of people in immigration detention. CREEC is pleased to host two Denver University law student externs this semester, Ali Sheets and Allison Crennan-Dunlap, for work with the Immigration Detention Accountability Project. 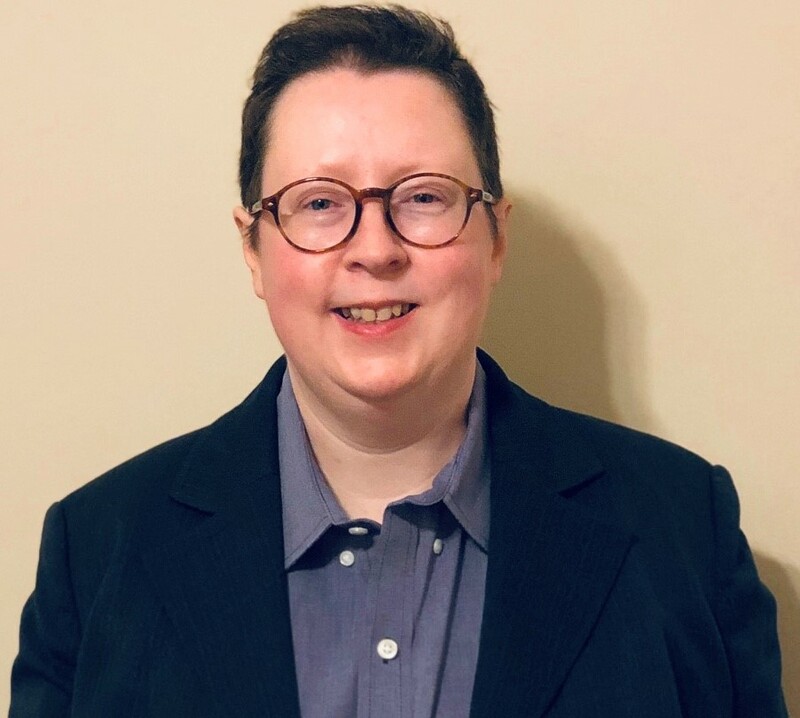 CREEC is extremely excited to announce the opening of CREEC’s Nashville office and the appointment of Martie Lafferty as CREEC’s new Director of Accessibility Projects. Martie will be focusing on representing people with disabilities in a variety o f access cases around the country, including access to communications and the built environment. Martie comes to CREEC with a wealth of experience, including litigating access cases against the State of Tennessee to eliminate barriers preventing access to the state’s court program — which resulted in the landmark case of Tennessee v. Lane, 541 U.S. 509 (2004) — and against a medical provider who refused to provide a diagnostic MRI to a wheelchair user. She has also represented numerous deaf and hard of hearing people who were refused effective communication in settings including housing, medical offices, hospitals, courts, jails, and legislatures. Prior to joining CREEC, Martie was a Litigation Associate at Stein & Vargas, LLP and previously Legal Director at Disability Rights Tennessee. Her extracurricular activities include picking her banjo, playing with her dogs, and attending concerts. Martie is admitted to practice in Tennessee. As we vow to do our best to kick as many asses as thoroughly as Carrie did. The world has lost a fierce advocate, brilliant lawyer, and talented photographer. Carrie Ann Lucas, a disability rights attorney who pioneered representation for parents with disabilities, died from complications from septic shock. She was 47 years old. 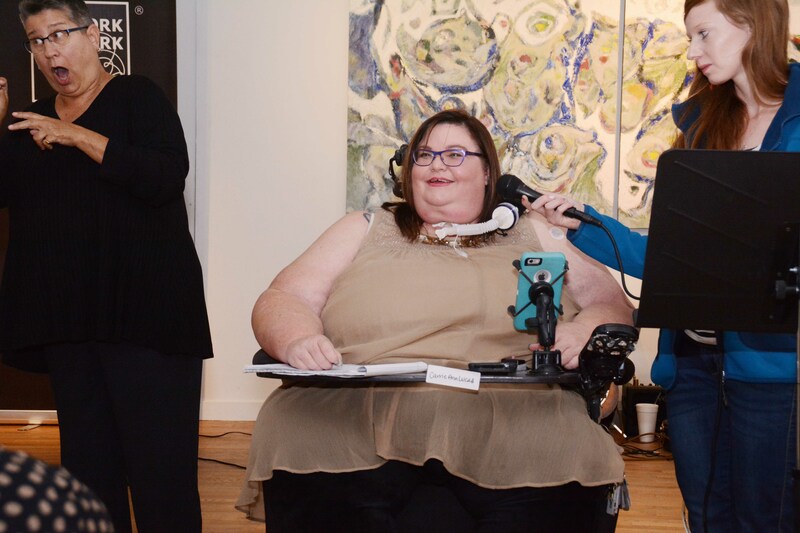 CREEC recognized Carrie in 2016 for her work in intersectional civil rights, celebrating her outstanding leadership in disability rights, parents’ rights, LGBTQI rights, human dignity, and faith. CREEC’s Co-Executive Directors first worked with Carrie not long after they started their small civil rights law firm in 1996, when she asked us to challenge her graduate program at the Iliff School of Theology for their failure to provide access and effective communication. While she was working on her Masters of Divinity there, she worked with others to protest institutional racism on the faculty and in the library. This was not her first protest: early on, she protested her high school’s refusal to permit a disabled student to march with the band. After getting her M. Div., she worked at the Colorado Cross-Disability Coalition, got her law degree at the University of Denver (on the full-ride Chancellor’s Scholarship), got a prestigious Equal Justice Works fellowship, and founded Disabled Parent Rights, a non-profit devoted to ensuring that people with disabilities have equal rights in parenting. She also became a national expert and trainer on the rights of parents with disabilities and, through her legal advocacy, secured decisions upholding and promoting those rights here in Colorado. Most recently she was recruited by the Colorado Office of Respondent Parents Counsel to help set up a program to train other lawyers around the state to replicate the sort of impact she was making. During all of this time, she also acted as the plaintiff in a number of ground-breaking disability rights lawsuits, including one of the largest public accommodations class actions and others bringing equal access to a variety of different facilities. Throughout her life, Carrie taught, protested, litigated, wrote, and advocated for a broad understanding of civil rights and human dignity, and consistently brought an intersectional approach to her work: bringing the parental perspective to disability rights, and vice versa; insisting on disability rights in civil rights spaces; and the importance of voices of color and LGBTQI people in disability rights spaces. Carrie may have been the only wheelchair-using Latina with a bumper sticker reading “just another disabled lesbian for Christ,” dressed in camo, driving her trak-chair into the wilderness in search of the perfect photo. While the immediate cause of death was septic shock, Carrie was in fact the victim of our healthcare system and the brutal cost containment procedures of her insurance company, UnitedHealthcare. Carrie had a severe neuromuscular disease, a rare form of muscular dystrophy. She relied on a power wheelchair, and had used a ventilator for years. In January of 2018, she got a cold which turned into a lung infection. UnitedHealthcare refused to pay for the specific inhaled antibiotic that she needed, instead forcing her to take a less effective drug, to which she experienced a severe reaction. This created a cascade of problems and loss of function (including her speech). United Healthcare’s attempt to save $2,000 ultimately cost over $1 million in health care costs over the past year. We are very grateful for all Carrie has taught us about disability rights and intersectionality, and for being a brilliant and hilarious colleague and friend. We will miss her very much. Allison Crennen-Dunlap is a Chancellor Scholar and J.D. candidate at the University of Denver Sturm College of Law. She has worked as a student attorney with the Sturm College of Law’s Immigration Law & Policy Clinic and completed legal internships with various organizations, including the Rocky Mountain Immigrant Advocacy Network and the Justice and Mercy Legal Aid Center. She earned her M.A. at the Pennsylvania State University, where she was a McCourtney Distinguished Graduate Fellow, and graduated with her B.A. from Georgetown University. In her free time, Allison enjoys exploring new places and strolling through Denver’s parks with her husband and four-year-old daughter. Alison “Ali” Sheets is in her final year at Denver Law. Ali is also a Chancellor Scholar at Denver Law, which is based on both public interest work and merits. While in school, Ali has worked on a variety of issues, including immigration, asylum, crimmigration, death penalty and international law. She regularly volunteers with an immigration non-profit in El Paso, Texas. Ali is simultaneously pursuing a Masters in International Human Rights at the Korbel School of International Studies, where she focuses on human trafficking and is a Research Assistant in the Human Trafficking Clinic. In her free time, Ali enjoys hiking, trivia, and spending time with her dog. Jean Peterson is CREEC’s paralegal-turned-extern. She is a 2L at the Denver Law. Jean graduated from the American University with a B.A. in International Studies. Following her legal interests instead of her degree, Jean worked for the U.S. Department of Justice in D.C. in their Securities and Financial Fraud Unit. She joined CREEC as a paralegal in 2016 and has been juggling her work here with her legal studies since 2017. Jean is using extern opportunity to hone her increasing legal knowledge to be a better advocate and asset to CREEC. When she can find a sliver of free time she likes to hike, ski, ride, play with her dog, and read. * It’s snowing here in Denver but the semester is called “spring” so we’ll just go with it. 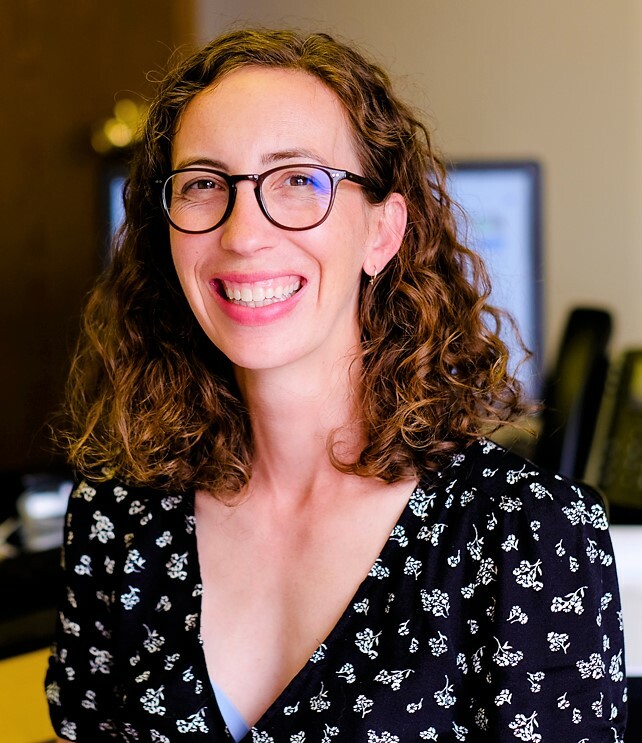 The Civil Rights Education and Enforcement Center is pleased to announce the launch of the CREEC Immigration Detention Accountability Project and the appointment of Elizabeth Jordan as Director of the Project. Education and outreach on detention conditions and treatment of immigrants with disabilities. The Project will also provide pro bono direct representation of detained immigrants — in immigration and federal court — in support of these three goals. have prepared and circulated educational materials on the rights of detained immigrants with disabilities. Based on the success of Liz’s fellowship project, we decided to create a permanent Immigration Detention Accountability Project. The Project joins — and complements — CREEC’s ongoing education and litigation projects challenging discrimination in government, prisons and jails, public accommodations, housing, and other arenas. The Project’s website can be found by clicking here, please check up on that site for Project and case related updates in the future. Family alleges refusal violated the Fair Housing Act. DENVER, August 6, 2018 – Nina and Robert Lindstrom had been planning for years to move from Alabama to Colorado to be closer to Nina’s daughter and their grandchildren. While preparing for the move, however, Nina Lindstrom fell and injured her spine. She now cannot walk and uses a power wheelchair for mobility. After the accident and months of intense rehabilitation, the Lindstroms were finally able to move to Colorado. Their house hunting process led them to the Autumn Valley Ranch community in Dacono developed by Century Communities, Inc. (“CCI”). Autumn Valley Ranch was ideal both because it was near family and because construction on the homes had not yet commenced, giving the Lindstroms — or so they thought — the opportunity to adjust the floorplan to be accessible to Ms. Lindstrom. When they initially met with a CCI sales representative and explained the modest adjustments they’d need — wider doors; level entrances — he appeared willing to implement the requested changes. (Though not obligated to do so, the Lindstroms offered to pay any difference in construction costs.) The following day, however, the CCI representative informed the Lindstroms’ Realtor that he had checked with CCI’s Vice President of Construction and Division President, and CCI would not be willing to make any accommodations in the floorplan. To be clear, at the point when CCI refused to make the Lindstroms’ accommodations, the “home” consisted of a patch of dirt and some drawings. The Lindstroms continued their home search, eventually purchasing an existing house that required extensive renovations before Ms. Lindstrom could use it, and that remains less than fully accessible. LOS ANGELES — The American Civil Liberties Union, Prison Law Office, and Civil Rights Education and Enforcement Center filed a lawsuit today against President Trump and Immigration and Customs Enforcement for violating the constitutional rights of immigrants detained at FCI Victorville, a federal prison in Victorville, California. In early June, ICE began transferring immigrants from ICE and Customs and Border Protection facilities to prisons operated by the Federal Bureau of Prisons (BOP), through an agreement that sanctions the detention of 1,600 people in BOP facilities in Washington, Oregon, California, Arizona, and Texas. Many of those imprisoned are asylum seekers. Some have been separated from their children. Security and health care staff at the prison have protested that it is ill-equipped to handle this influx of detainees. Several housing units at the prison that were previously closed due to understaffing reopened in June for the purpose of detaining immigrants, and staffing remains deficient. Detained immigrants describe conditions at the prison as dangerous and chaotic. Attorneys on the case believe this is a human rights crisis for those detained. Immigrants detained at Victorville have had little communication with the outside world. They have not been provided adequate medical or mental health care and suffer verbal abuse and threats of isolation when they ask for medical help. They do not have access to legal materials and the most basic information is only provided to the detainees in English — which most of them don’t speak. They face additional deprivations including inadequate and insufficient food, and minimal access to outdoor spaces for fresh air and sunlight. The men are also unable to practice their religious beliefs. Victorville officials have refused to provide religious services or other opportunities for group worship and prayer. By policy, the men are not allowed to worship outside of their cells. Officials have not provided meals that fully comport with all of the men’s’ religious needs, forcing them to eat food that violates their faith or go hungry. The men’s religious items, including religious clothing and texts, have been confiscated. “Through its so-called ‘zero-tolerance’ policy, ICE has created a situation in which people who have violated no criminal laws and are simply seeking a better life are imprisoned and subjected to unconstitutional conditions, a pattern and practice unworthy of this country,” said Tim Fox, co-Executive Director of the Civil Rights Education and Enforcement Center. Click here for a PDF version of the complaint filed today.